Today’s random product review is a Pyramid DVD that contains two Superstar Rajinikanth’s Tamil movies, Baba (2002) and Sri Ragavendra (1985) (also spelled at least as Sri Ragaventhrar and probably also as some other combinations of similar letters). I have no prior experience about the quality of these cheaper 2-in-1 DVDs compared to the usual 1-in-1 DVD releases but I would guess that the quality of a movie in 2-in-1 DVD isn’t as good. Let’s do some comparison! I have also Baba DVD by Ayngaran and Sri Ragavendra DVD by Bayshore. The most natural way to compare these is to take screenshots of the same frame in each version and check which of them looks better. I actually bought the 2-in-1 DVD because I hadn’t found Sri Ragavendra with English subtitles and it clearly says “WITH ENGLISH SUBTITLES” right there in the cover. 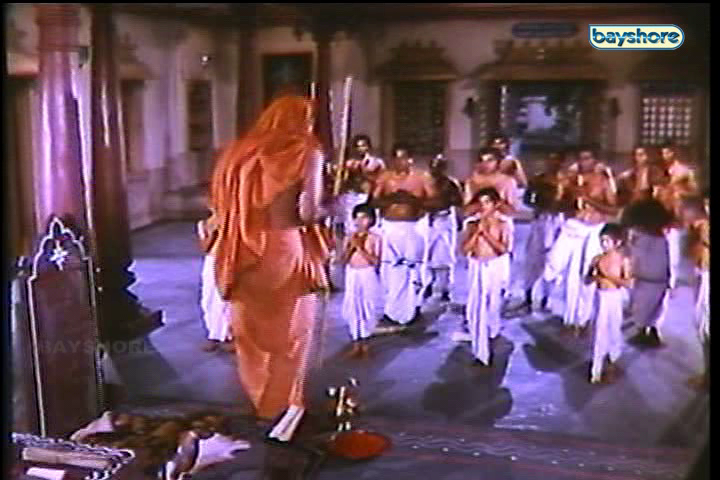 Surprise surprise, this version of Sri Ragavendra doesn’t have English subtitles. Yes, it also says “BABA WITH SUBTITLE”, but it doesn’t say “SRI RAGAVENDRA WITHOUT SUBTITLE”, so basically this can be considered cheating. It’s actually quite surprising that this movie doesn’t seem to have a subtitled release. Sri Ragavendra is known as the 100th film of Superstar Rajinikanth. (I’m not sure how that is counted as it is number 107 on my list. Maybe they don’t count the remakes of his earlier movies?) Even though it was a flop at the box office, only the fact that it’s his 100th film would be enough to get people to watch it. Maybe there just aren’t enough non-Tamil speaking Rajinikanth fans or something? Now that it doesn’t have subtitles, I too won’t probably watch it before I’ve seen most of the subtitled Rajinikanth films. Here are the screenshots. The first one is from the Pyramid version and the second one from the Bayshore version. (Click to see them in full size!) The picture from the Bayshore version is slightly more detailed. The only thing that is worse in Bayshore DVD is that it has Bayshore’s logo on the top-right corner and an almost transparent but still visible watermark on the left side while there are none in the Pyramid version. But I would probably still watch the movie from the Bayshore version. Both versions of Baba have subtitles. The first thing I noticed was that Ayngaran’s version of the film is 180 minutes long while Pyramid’s version is only 174 minutes. I didn’t check if there are any missing scenes in the Pyramid version or does it just play the film faster. Ayngaran DVD is clearly the winner of the picture quality comparison. 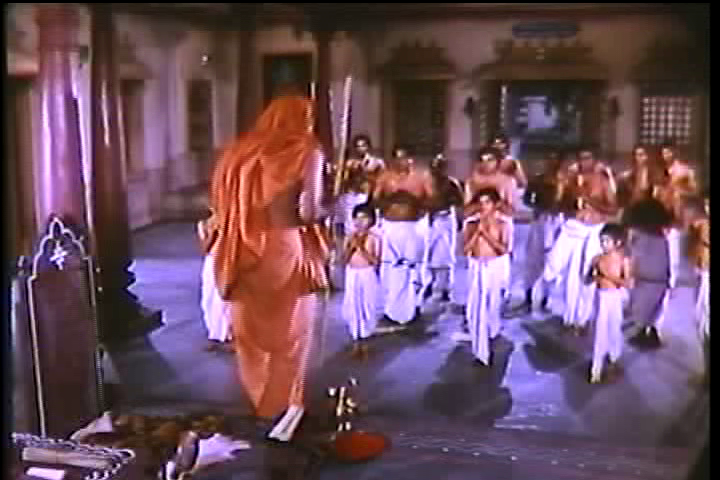 Most notably, there are more recognizable details and the orange colour is much brighter in the screenshot from the Ayngaran’s version (the second one). Looks like Pyramid’s version is horizontally stretched and then the picture is slightly cropped. Pyramid also has a big but fortunately mostly transparent watermark at the top-right corner. 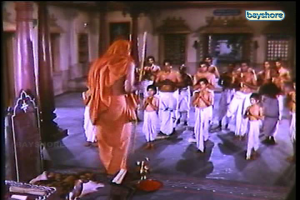 If I’m going to re-watch the film some day, I will definitely watch it from the Ayngaran DVD.